The technology behind all organ care devices is mainly the same which consist of at least one (or more) pump unit(s), for most devices a Thermo unit and a work bench/trolley, in addition, offering tools for optimal pre-conditioning, preservation and re-conditioning. The main difference is that every device is designed for a specific organ type. OCS modelled to increase the time frame for organ preservation outside the body in a condition suitable for transplantation by minimizing time dependent ischemic injury, provide surgeons the window to assess the function of the organ outside the body and allow resuscitation of the organ and potentially improve function after removal from donor. TransMedics has developed the organ care system based on the company's warm blood perfusion technology and contributed USD 51.2 million to support its organ care system. The organ care system market is expected to reach USD 0.23 billion by 2025, growing at a CAGR of 8.6% during the forecast period. OCS provides with substantial benefits to patients, physicians and third party payors like improved patient outcomes, increased utilization of available organs; expanded supply of organs, and reduced total cost of care. In addition, better time management, improved organ quality, more transplantable organs, easy to transport and operate are the budding factors to expand the organ care system market worldwide. However, extending period of clinical trials and risk of malfunctions are expected to impact the target market negatively. The organ care system market is anticipated to expand on the back of increasing incidence of cardiovascular transplantation across the globe. Liver-assist segment accounted for 46.7% of the overall organ care system market in 2017. While donor assist tends to dominate the market in the forecast period owing to the increasing number of organ transplant surgeries across the globe. On the back of rising number of deaths due to organ failure, organ donation trend among the well aware population base and technological advancements in healthcare with better healthcare infrastructure, North America Organ Care system market is likely to grow at remarkable rate during the forecast period. On the other hand, Europe & APAC tends to grow substantially owing to increasing number of organ transplant procedures and cost-effective solution for organ preservation. The report covers the present ground scenario and the future growth prospects of the facility management market for 2017-2025 along with the market players’ analysis. We calculated the market size and revenue share on the basis of revenue generated from major players worldwide. Global Organ Care System market is forecasted on the basis of revenue analysis, product benchmarking and strategic developments of key market players. Global Organ Care System Market Outlook 2017-2025, has been prepared based on an in-depth market analysis from industry experts. The report covers the competitive landscape and current position of major players in the Organ Care System market space. The report also includes porter’s five force model, SWOT analysis, company profiling, business strategies of market players and their business models. “Global Organ Care System Market Report” also recognizes value chain analysis to understand the cost differentiation, pricing models to provide competitive advantage to the existing and new entry players. 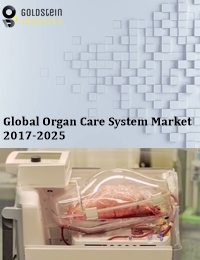 Our Global Organ Care System Market Report comprises of the following companies as the key players: TransMedics Inc., XVIVO Perfusion AB, Organ Assist B.V., Organ Recovery Systems Inc., Organ Transport System Inc., Water Medical System LLC, Paragonix Technologies Inc., OrganOx Limited, Preservation Solution Inc. and Bridge to Life Ltd.